Financial companies need to create a experience for clients where they’re at the centre of every all decision-making, a new survey by Econsultancy has found. In order to achieve this, they’re going digital. The findings can be seen as a response to research that we released earlier this year, which showed that establishing trust with leads and clients was the top marketing priority for financial services. Faced with being the least trusted industry, financial companies are using digital tools to create a customer experience with the sole aim of delivering value. According to respondents, providing a top customer experience using digital channels is the “single best opportunity” to deliver on these priorities for 2015. 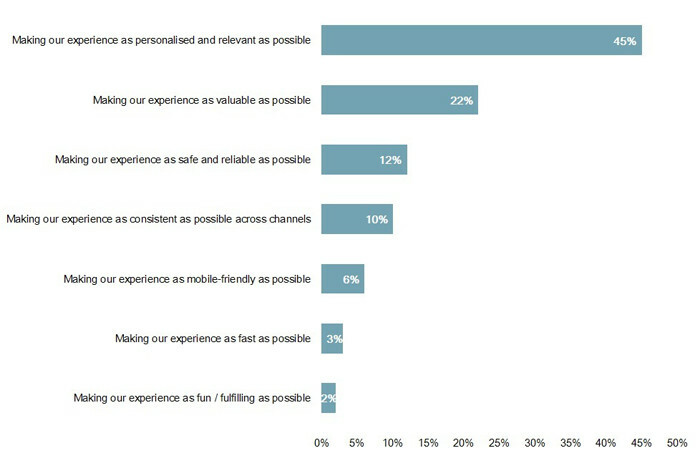 The majority – 45% – said that this will lead to a personalised and relevant client experience. This will take different forms. For financial advisers, it could be a detailed explanation of how to invest, providing a rationale so they can understand the decisions you’re going to make with their investments. For fintech providers, it could be a monthly round up of the latest research that will impact investor strategies. Whichever form it takes, quality content can create a personalised, relevant and valuable client experience. So, here are three actions that financial companies can take to benefit from the digital transformation, with examples of best practice. It’s also another communication channel to reach leads and clients to compliment traditional methods such as phone calls, meetings, events and e-mails. One conclusion from the Econsultancy report was that companies needed to use more agile ways of working. This video is a good example of this agility in action. Clients look for different things at different stages of their journey. Before you start putting together any marketing strategy, find out how they buy your services. What’s the thought process? For smaller, more flexible organisations, this represents an opportunity to take on the bigger financial institutions. With a greater understanding of where new clients are coming from and how they decide on their financial provider – whether that’s as an accountant, financial adviser or fintech company – you can respond by giving them the information they need at the moments that they need it. A clear understanding of how a lead makes a purchase decision through digital channels (along with a personal touch in the content, which always helps) has lead to strong returns for Pete and his financial firm. Following on from this point, it’s not just about having the content, it’s also about the quality. A report from Accenture about digital intelligence in financial services suggests that those institutions that offer timely, relevant and personalised online experiences have been shown to boost sales, reduce costs and increase trust and loyalty. Content has an important role to play in this process.